The UK Government’s strategy is not for an integrated society, focusing on what government and society could and should do, but for integrated 'communities', code word for everyone else. 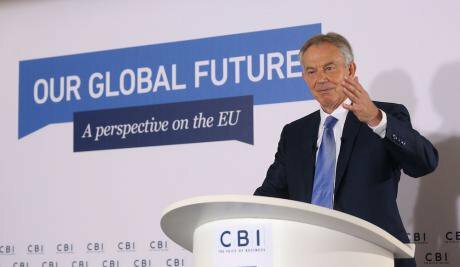 Tony Blair delivers a speech about Europe during a CBI event at the London Business School in central London, in June 2014. Philip Toscano/Press Association. All rights reserved. After a bit of fanfare, a couple of catchy soundbites and a few top-line proposals leaked a day or two before the release, the Department of Housing, Communities and Local Government’s (DHCLG) Integrated Communities Strategy Green Paper was released on March 14. The Green Paper places much emphasis on the importance of social integration which is referred to as “meaningfully” mixing with people from different backgrounds. Although the remit for both the review and the Green Paper was wide and intended to address the whole population, the emphasis in both has tended to be new migrant and minority communities. The title — Integrated Communities Strategy — gives a hint to the direction the report is taking. The paper sets out the Government’s strategy to create not a more integrated society, which would put the focus on what the government and society at large could and should do together, but integrated communities, code word for everyone else. The paper is the official response to the so-called Casey Review of 2016 whose focus in turn was on “our most isolated and deprived communities”. It is not only that the others need to be made to integrate more and better, but that they are also constructed as isolated from mainstream society, some kind of Barnum circus specimen interesting, even fascinating but totally alien to us, always and by definition from somewhere else. In this narrative, isolation, deprivation, lack of participation are always constructed as having little to do with the conditions of one’s stay in Britain and factors such as structural discrimination and huge wealth inequality. Instead, the onus of integrating is always and inexorably on ‘them’. Thousands of pages have been spent defining and trying to capture and measure ‘integration’ (and germane concepts such as ‘assimilation’, ‘incorporation’, ‘multiculturalism’, ‘pluralism’, ‘diversity’, ‘super-diversity’). The concept is analytically slippery and elusive, hard to pin down. The main reason for this is that it is inherently ideological, in that it is there as a post-holding term for whatever ideal of a good society a particular government envisages (often as a short-cut to shoring up the ruling assemblage of forces in any particular time and place). Using an example from across the Atlantic, we can imagine that what may have counted as an integrated society for someone like Barack Obama, may not appear as such to someone like Donald Trump. What may have counted as an integrated society for someone like Barack Obama, may not appear as such to someone like Donald Trump. In the UK, there is little doubt that Tony Blair’s integrated society hardly resembled that of Theresa May. The former was built on the idea of Britain being fully part and playing a leading role in the EU and its enlargement towards central, northern and eastern Europe. As such, Blair’s Britain included new and old EU nationals in the British national fabric – an inclusion well illustrated also by the use of the term ‘migrants’ only for ‘the others’ – those coming from outside the EU. The power assemblage emerging from the EU referendum in June 2016 that supports PM Theresa May envisions a very different (if as yet contradictory) idea of Britain and its place in the world – oscillating between ‘Global/Empire Britain’ to ‘Little England’, but certainly excluding ‘European Britain’. This shift of vision for Britain translates in society in several ways, including directly and indirectly legitimising anti-European xenophobia. But this is, luckily, an extreme manifestation of this shift. A wider implication of this is that it has become politically acceptable to use over 3 million EU nationals living in the UK as a bargaining chip in the EU negotiations, keeping them in limbo as far as their future in Britain is concerned for what is now over 600 days. Don’t be under any illusion that the December agreement between the UK and the EU solved much: the principle that underpins the agreement ‘nothing is agreed, until everything is agreed’ leaves everything pending until the end of the negotiation. But the dehumanisation of foreign-born residents started earlier and become state policy when Theresa May championed the creation of a ‘hostile environment’ for ‘illegal’ migrants in Britain as a key policy goal. Far from being a targeted intervention, hostile environment initiatives have been affecting regular and irregular migrants alike and often also BME citizens. Foreign born residents and visible minorities have been increasingly asked to prove their right to stay in Britain in the context of a continuous shifting of goal posts for lawful migration. Foreign born residents and visible minorities have been increasingly asked to prove their right to stay in Britain in the context of a continuous shifting of goal posts for lawful migration. This latest threat to remove or force to leave international academics, elderly people who have lived in the UK for four decades, parents in mixed-status families with young children, gives a good indication of the lengths to which the British Government is willing to go in pursuit of its agenda. What the ‘hostile environment’ does is to make everyone feel precarious, including individuals and families who have resided in Britain for decades. It constructs all migrants, including EU citizens, as potentially ‘illegal’. To all these people, it is obvious that the proposals included in the DHCLG Integrated Communities Strategy herald another round of the British government asking yet more from them, yet another exam to prove their worth to Britain, rather than a genuine concern for making their lives in Britain better and more fulfilling for all of us together.